The leaders of the G7 states are ready to impose additional sanctions on Russia, if the situation in Ukraine worsens, according to a joint statement issued by the member states, following a two-day summit in the south of Germany. 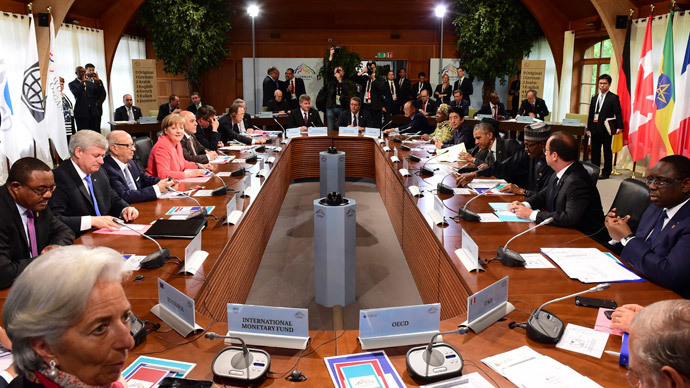 On Monday, the G7 issued a joint communiqué summing up the results of their meeting. In regard to the Ukrainian crisis, the leaders agreed, “that the duration of sanctions should be clearly linked to Russia’s complete implementation of the Minsk agreements and respect for Ukraine’s sovereignty." “However, we also stand ready to take further restrictive measures in order to increase cost on Russia should its actions so require,” it added. “There were discussions over additional steps,” if Russia “doubles the aggression on Ukraine”, however they were on a technical and not political level, he added. “Our hope is that we don’t have to take additional steps,” he added. The host leader of the 2015 summit, German Chancellor Angela Merkel joined Obama by saying that the group is “also willing, if it is necessary, but this is not what we want, to toughen the sanctions if the situation requires us to do so." Meanwhile, Merkel also said that international conflicts can be solved in cooperation with Russia. "We have several negotiation formats in which Russia takes part,” she said at a media conference. On Sunday European Council President Donald Tusk said “all of us would prefer to have Russia around the G7 table.” However he added he does not see this as a possibility at the moment. All would prefer to have #Russia around the table. But #G7 is a community of values & that's why Russia is not here today. On Monday Kremlin spokesman Dmitry Peskov told reporters that Putin is concentrating on “work in other more effective formats” that reflect the actual international situation. Russia has said on multiple occasions that it is not taking part in the conflict in Ukraine and it can only urge the eastern Ukrainian militia’s to abide by the Minsk agreements. In March, Russian Foreign Minister Sergey Lavrov said Moscow is ready to “continue dialogue” if all sides agree to refrain from making Russia a “side of the conflict”. At a UN Security Council meeting on Saturday, Russia’s UN envoy, Vitaly Churkin, called on the state-members to use their influence on Kiev and “make all efforts” to assure the situation in the east of Ukraine does not worsen. Investigative journalist Tony Gosling told RT that it seems Western politicians are being driven by the US into the anti-Russian rhetoric. “This is our old Cold War talk, that is really driven by the Americans, and it certainly does not represent the views of European people or business, which is a bit worrying,” he said. While this policy may serve the interests of US and UK elites, it isn’t to the benefit of most European countries, political commentator Caleb Maupin told RT. “Germany and many other countries throughout Europe are basically being forced to work against their own interests in order to help the United States,” Maupin said. Russia sanctions seem to have hit the EU countries harder than the US. On Sunday, Cameron said Europe had to stay united to keep sanctions on Russia in place despite the pain they have caused. There has been a recent escalation of violence as residential areas were shelled in eastern Ukraine’s rebel-held territories. The Organization for Security and Cooperation in Europe (OSCE) monitors have reported violations of the Minsk ceasefire agreements by both sides in the conflict. Moscow blames the spike in hostilities on Kiev and said that the timing is not accidental, linking it with the upcoming EU summit in Brussels. “Yes, indeed, in the past Kiev had already heated up tensions amid some large international events. This is the case, and now we are seriously concerned about the next repetition of such activity,” Kremlin spokesman Dmitry Peskov said Thursday. The US has ignored the fact that both sides have committed the violations mostly blaming the rebels. On Thursday, US State Department spokesperson Marie Harf refused to directly acknowledge Kiev’s role in violating the ceasefire.